A study in organic architecture, indoor/outdoor living is incorporated in nearly every room of this beautiful mid century modern. Artfully crafted walls and ceilings use wood, cork, and tile. Ingenious sky lights and floor to ceiling walls of glass & sliding doors open to private atriums, patios and landscaped grounds. Completed by fine craftsmen and in the style of the work from the years when a unique movement fostered collaborations between artists and designers, this caliber of property is rarely available. 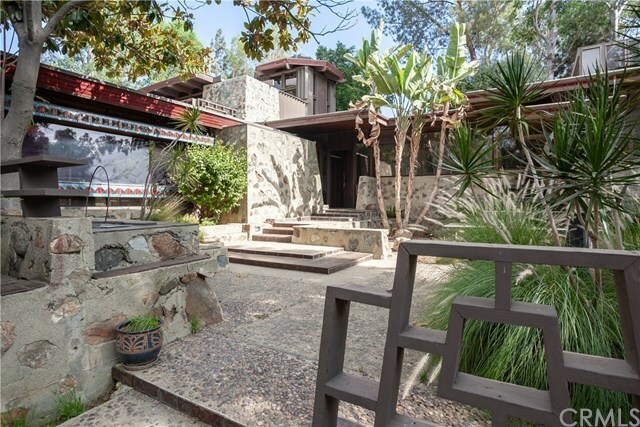 Architect Foster Rhodes Jackson, a student of Frank Lloyd Wright, worked with the owner to design and build this home, constructed over years, in conjunction and consultation with Sam Maloof, one of the finest woodworkers of our time. Leaded and stained glass windows throughout were done by local Claremont artist, Mike Hill. Nature, canyons or the hills are visible from nearly every part of the home. Situated on over an acre of a scenic knoll, near the top of Live Oak Canyon, the home features original fixtures, clever lighting, sconces, built-in furniture such as sofas, bed platforms and night tables, bookshelves, desks, lighted vanities, cedar closets & storage cabinets and much more. Each of the 6 bedrooms is a suite, and feature 1 or multiple sitting areas, bathrooms and fireplaces. The master suite, the only upstairs room, is accessed by ascending the Maloof spiral staircase.